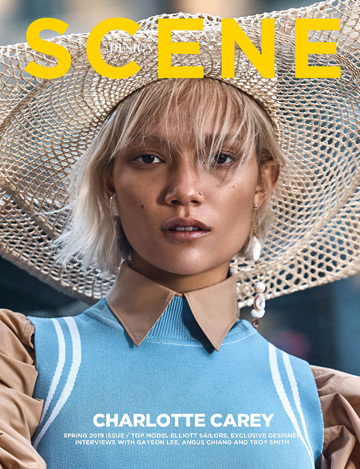 Welcome to the 13th issue of DESIGN SCENE, easing us into the new year by celebrating the best of winter collections and introducing the first look of the spring ahead. Thanks to the idiosyncrasies of magazine publishing our January/February issue comes out in December, just as the most of us are finalizing Christmas preparations, rather than New Year resolutions. In our mission to celebrate young talent, we teamed up for the cover story with a breakthrough face on the modeling scene, Agnes Sokolowska. This promising girl with her signature haircut has already dominated the pages of prestige glossies such as Vogue, W Magazine, Interview Magazine, IO Donna and ELLE to name a few. Agnes was photographed in London by Rui Faria while taking her time to speak to our contributing writer Matti Bygod. In other stories, we made sure to spotlight the best of winter collection’s, with coveted pieces ready to be plucked from the shelves in the 1st seconds of sale season commencing. Our contributors bravely hit the great outdoors just like in the stunning nordic sea shoot by Christian Davila Hernandez featuring Alex Van Der Steen’s styling as well as Alex Huanfa Cheng’s shoot captured in France. Followed by Alejandro Cabezut’s bohemian take on Central Park in New York and Victor Yuan and Silvester Yiu’s adventure to a Mediterranean Island. While for Meet Me In Montauk story our team in Singapore under the lense of photographer Mun Kong prepared a cinematic tale of romance. Elsewhere in the issue F&G photography duo brought a Marie Antoinette beauty inspiration to the table, while photographer Mirja Zentgraf worked with stylist Lisa Filippini to display the contemporary moments from the likes of Samsoe & Samsoe, Hugo Boss and Calvin Klein. We left the studio prep to Francesco Menicucci and Stefano Guerrini who brought in the nostalgic prints from the likes of Burberry and Roberto Cavalli alongside Italian breakthrough labels such as Leitmotiv and Giuseppe Di Morabito. Going from the editorial stage this time we might have gone into more conversations than ever before. Just before our conversation with Agnes, I try to ponder on my own the Milan Fashion scene with the anxiety of the month of fashion week in front of us. This is followed by my interview with fellow Editor In Chief Petar Janjatovic who talks about trials and tribulations of running a Bazaar international edition. We covered the design department in inspiring conversations of our Katarina Djoric with Europeans Dyer-Smith but she also had the time to talk to a true New Yorker, Taylor Spellman a girl going strong with her interior design business and a show of her own on BRAVO. The art department is covered with exclusive conversations featuring artist Magnus Gjoen who gives the new life to classical art, but also Italian furniture designer Emanuele Magini who brings back the originality to the design capital. Another great story comes in Katarina’s conversation with one of the most promising designers on the scene, the young Peet Dullaert who already established himself on the Paris fashion scene thanks to the originality displayed in his eponymous line. With an army of these hard working creatives, compiling a new years resolution might not be an easy task, but it is sure to be an inspirational endeavor.